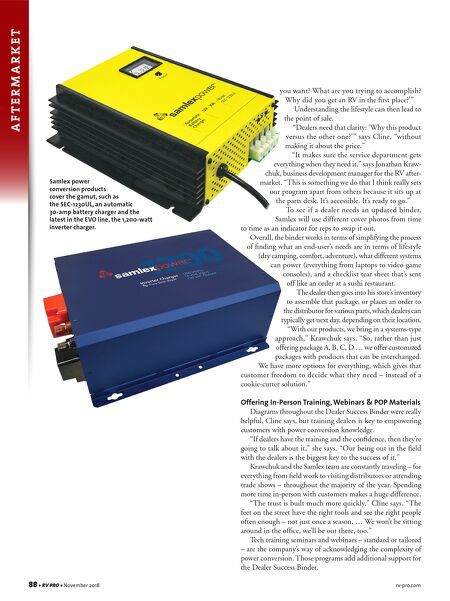 88 • RV PRO • November 2018 rv-pro.com A F T E R M A R K E T Samlex power conversion products cover the gamut, such as the SEC-1230UL, an automatic 30-amp battery charger and the latest in the EVO line, the 1,200-watt inverter charger. you want? What are you trying to accomplish? Why did you get an RV in the first place?'" Understanding the lifestyle can then lead to the point of sale. "Dealers need that clarity: 'Why this product versus the other one?'" says Cline, "without making it about the price." 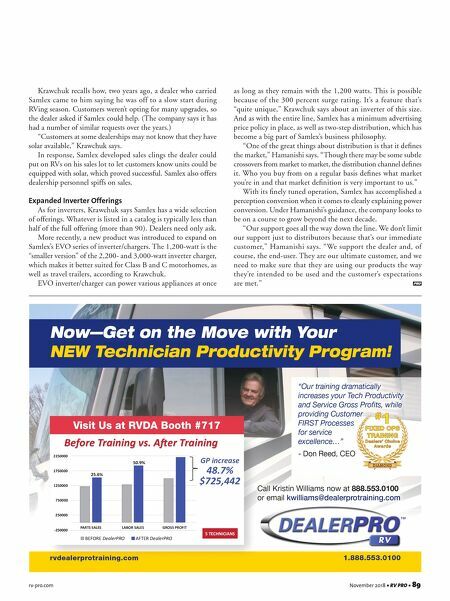 "It makes sure the service department gets everything when they need it," says Jonathan Kraw- chuk, business development manager for the RV after- market. "This is something we do that I think really sets our program apart from others because it sits up at the parts desk. It's accessible. It's ready to go." To see if a dealer needs an updated binder, Samlex will use different cover photos from time to time as an indicator for reps to swap it out. Overall, the binder works in terms of simplifying the process of finding what an end-user's needs are in terms of lifestyle (dry camping, comfort, adventure), what different systems can power (everything from laptops to video game consoles), and a checklist tear sheet that's sent off like an order at a sushi restaurant. The dealer then goes into his store's inventory to assemble that package, or places an order to the distributor for various parts, which dealers can typically get next day, depending on their location. "With our products, we bring in a systems-type approach," Krawchuk says. "So, rather than just offering package A, B, C, D … we offer customized packages with products that can be interchanged. We have more options for everything, which gives that customer freedom to decide what they need – instead of a cookie-cutter solution." Offering In-Person Training, Webinars & POP Materials Diagrams throughout the Dealer Success Binder were really helpful, Cline says, but training dealers is key to empowering customers with power conversion knowledge. "If dealers have the training and the confidence, then they're going to talk about it," she says. "Our being out in the field with the dealers is the biggest key to the success of it." Krawchuk and the Samlex team are constantly traveling – for everything from field work to visiting distributors or attending trade shows – throughout the majority of the year. Spending more time in-person with customers makes a huge difference. "The trust is built much more quickly," Cline says. "The feet on the street have the right tools and see the right people often enough – not just once a season. … We won't be sitting around in the office, we'll be out there, too." Tech training seminars and webinars – standard or tailored – are the company's way of acknowledging the complexity of power conversion. Those programs add additional support for the Dealer Success Binder.